While some might point to Christopher Nolan's Interstellar as this year's Gravity, largely due to their shared genre and similar release date, that title truly belongs to Alejandro González Iñárritu's odd dark comedy Birdman. Or, to give it its full, grammatically baffling title, Birdman or (The Unexpected Virtue of Ignorance). There are some personal connections between the two films - Iñárritu and Gravity's director, Alfonso Cuarón, are longtime friends, while the films share a cinematographer in Emmanuel Lubezki. The more substantial connection lies in a shared formal daring, and a willingness to approach relatively straightforward stories in ways which are stylistically adventurous. It's easy to imagine the films as a game of oneupmanship between two friends at the height of their respective powers. Both films make use of long, unbroken takes to create the sense that the audience are watching events occur in something like real time. Gravity famously opened with an unbroken single shot in which a space mission is fatally disrupted by space debris, while Birdman is filmed so that each of its incredibly long takes bleeds into the next, creating the illusion that the film consists of only two long shots broken up by a few inserts. The two are also thematically similar in that they are both elaborate entertainments built around performers who are on screen for pretty much the entire running time, and they both deal with mental and physical deterioration under stress. The key difference is that while Gravity uses its long takes to imbue a fantastic situation with visceral authenticity, Birdman uses the same technique to make a realistic situation feel otherworldly. Michael Keaton stars as Riggan Thomson, an aging film actor who was once the star of a series of highly successful superhero films (the first of many meta-textual winks throughout the film). Twenty years earlier, Riggan walked away from the lucrative Birdman franchise after the third film for being, in the words of his alter-ego, who appears to him as Birdman and talks with a raspy voice, "Hollywood miserable." Having spent two decades struggling to find fulfilling work while being a terrible husband and a not especially present father, Riggan believes he has found redemption: a Broadway adaptation of Raymond Carver's "What We Talk About When We Talk About Love" on which he serves as the writer, director and co-star. Things go wrong almost immediately when a light falls and seriously injures one of his co-stars. Riggan's manager and producer Jake (Zach Galifianakis) brings in Mike (Edward Norton), a more prestigious actor to take over the part, which only produces further complications since not only is he dating one of the other stars of the play (Naomi Watts), but his obvious ability cause Riggan to become threatened, self-conscious and jealous. Throw in the fact that Riggan has to refinance his house to afford Mike's contract and he is distracted by the presence of his daughter Sam (Emma Stone) who, in addition to being his assistant, is also a recovering drug addict, you have all the ingredients in place for Birdman to, to quote a different Keaton superhero, get nuts. Not to belabour the point about Birdman's technical prowess, but as anyone who's sat through Alexander Sokurov's Russian Ark will tell you, a film shot in a single take (or one which looks like it was shot in a single take) can be stultifying and dull. The elaborate preparation needed to carry off such a stunt significantly reduces the capacity for spontaneity. Even Alfred Hitchcock, who similarly tied together multiple takes to make Rope appear as if it consisted of a couple of very long shots, couldn't fully overcome the restrictions of such an approach. At the other end of the spectrum, you have Gaspar Noé who, in attempting to make Irréversible look like it was shot in a continuous take, turned it into a looping, nauseating fairground ride. The reason why Iñárritu's film overcomes those limitations is that it never pretends that what we are seeing is occurring in real-time, or that it represents an objective reality. From the very first shot, in which Riggan is shown levitating in his dressing room, the film places itself inside the mind of a man whose grip on reality is very slippery. Iñárritu cleverly elides time within his shots by, for example, having the camera move from a conversation between Riggan and Jake about hiring Mike to Riggan and Mike's first meeting. A day or two has clearly passed between those two scenes, but the continuous movement of the camera means that their passage doesn't truly register with the audience. The effect is a disorientating and thrilling one. Birdman disregards traditional cinematic notions of space and time to create the world as Riggan Thomson experiences it; a seemingly endless stream of disasters and humiliation, intermingled with fantasies that are ridiculous, yet too appealing to dismiss, delivered as a stream of consciousness. By the time that Iñárritu has Riggan conjure up a giant metallic bird with the click of his fingers, the film has already immersed us fully in the existential soup that is its protagonist's brain. This approach also allows Iñárritu and Lubezki to make the camera move more freely. Since the links between each shot are hidden by conveniently placed shadowy corridors, there's no need for them to line up perfectly, so there's none of Rope's stilted orchestration. The takes feel organic, rather than like mere showing off. On the other hand, there's none of the freewheeling lunacy of Irréversible. There's control within each scene. Without the luxury of close-ups, every move has to mean something and has to capture some element of the performances. Lubezki makes ample use of mirrors to create ad hoc reverse shots, but for the most part the emphasis is on allowing the roaming camera to work with the actors to fill in the gaps where more traditional compositions would have been used. The camerawork is akin to the jazz drumming that makes up most of the soundtrack; you need tremendous skill and precision to appear that spontaneous and improvisational. It turns every scene into a kind of endurance test: The actors not only have to deliver their lines and hit their marks as they would on stage, they also have to be mindful of the camera (without appearing to be mindful) so that each scene can blend into the next. In that regards, Birdman's technique blurs the lines between the immediacy of theatre and the technical complexity of film, just as its story blurs the boundary between Riggan's fantasy and our reality. At the centre of all of this is Michael Keaton, who gives a performance that draws upon the very essence of his screen persona. Even at his commercial peak, Keaton radiated a sense of off-kilter danger. Beneath the sly wit and the sardonic smile, you always got the feeling that he could just start smashing things, then go back to whatever he was doing without missing a beat. 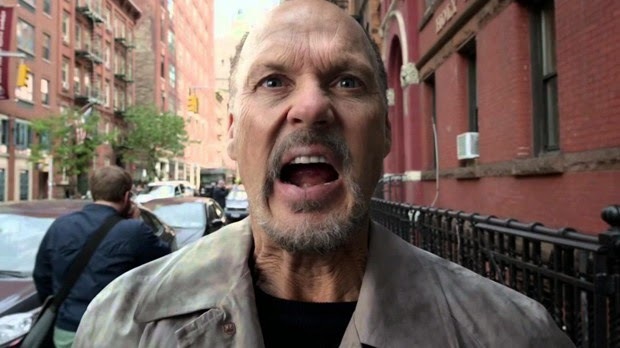 That sublimated craziness is just under the surface in Birdman since Keaton has to be the sort of charismatic, charming leader who can draw people to him and someone who is clearly mentally unbalanced. The film doesn't require much from him in terms of raw emotion, apart from several scenes with Stone (who is also fantastic) which vary in tone from recriminatory to sweetly nostalgic, but Keaton's ability to sell a gag while tap-dancing on the edge of a full-blown emotional collapse ensures that the darkness is never overwhelming or far from the surface. These are minor quibbles about what is a fairly strong piece of work. It may not be especially deep or provocative, but it's overflowing with energy and has an appealing goofy sensibility that makes for an intriguing contrast with its technical virtuosity. As someone who has disliked all of Iñárritu's previous films, I'll happily take that over his usual miserablist horseshit every time.